There aren’t many tools that bridge the gap between delicate artists and burly builders, but the best glue guns do. You’ll find them in the hands of hobbyists as well as repairmen and women. That’s because hot melt adhesives, or HMAs for short, offer all the benefits of solvent-based glue without the whole solvents-melting-your-brain thing. Because the glue can bond rubbers, metal, glass, wood and plastics it can be used as an alternative to solder in some electronics projects, as a way to create jewellery or other delicate items, to seal packages, to bind fabrics and even to bind books. When you’re looking for the best glue gun comfort is a key factor: if you’re going to be using it a lot, even minor differences in comfort soon become really big differences. For occasional use battery powered guns are fine, if a little slow to heat, but for regular sticking you’re better off with a corded model. Make sure you can get the glue sticks for it: the most common glue gun sticks are 7mm or 11mm but some models have manufacturer-specific sticks. We’d avoid manufacturer-specific ones, though. Generic sticks are really cheap and widely available, so there’s not much point in opting for one that’s likely to be more hassle and more costly too. -No bundled sticks-Heavy duty? Really? If you’re looking for a reliable glue gun that’s quick to heat up and offers maximum flexibility, Stanley’s model is hard to beat. It’s comfortable to hold, which is important. It has dual heat modes, enabling you to work with delicate fabrics as well as solid stuff such as metal. And the stand for when you’re not using it is good, too. Unlike other guns it doesn’t come with a million glue sticks – the price you pay is for the gun and nothing else – but it uses standard 11mm sticks and 11mm dual melt sticks. It’s very slightly more expensive than some rivals but it’s a solid choice that should last for a long time. What the chunky Titan model lacks in bells and whistles, it more than makes up for with solid build quality, a two-year guarantee and the ability to get on with the task in hand without complaint. It accepts standard 11mm glue sticks, although none are supplied in the box, while the ergonomic handle makes it easier to tackle those really fine and fiddly jobs. Also note the simple front stand, which stops your shiny new glue gun from becoming stuck to dining table. Textbook. Like the Stanley, this gun uses standard 11mm glue sticks. This boasts thermal insulation, an internal safety fuse and an anti-overheating case, and it heats up in three minutes. As the manufacturer boldly claims, "They are super strong adhesive and easy cleaning properties to protect your health and items." Uh-huh. Designed for frequent use, this excellent gun also comes in 150W and 300W versions, for those who need to get more serious about their glueing. Bosch’s glue gun uses standard 11mm glue sticks and has two heat settings: 200W for warming up and 16W to keep the glue gloopy. The nozzle is longer than most, which means it can reach the places other glue guns can’t, and it has an automatic glue retraction mechanism that stops drips, ensures that the nozzle doesn’t dry out and enables the gun to deliver a constant stream of glue. It’s a little on the heavy side at 458g but if you’re serious about sticking things together the lack of drips means you won’t mind the slightly heftier weight of the Bosch. It’s just a shame that Bosch decided not to put a power switch on the gun itself: if you want to turn it off you need to do so at the plug. Are you starting to get the impression that most glue guns are largely the same? Well, this Mac Allister unit boasts similar specs to most mentioned here but lacks some of the temperature adjustment of more expensive models. There's also a distinct lack of glue sticks in the box, meaning you'll have to purchase those separately before getting sticky with it, but Mac Allister is a trusted name in the power tool game. Expect a five- to seven-minute heating time, as well as a smooth trigger action on this little puppy. 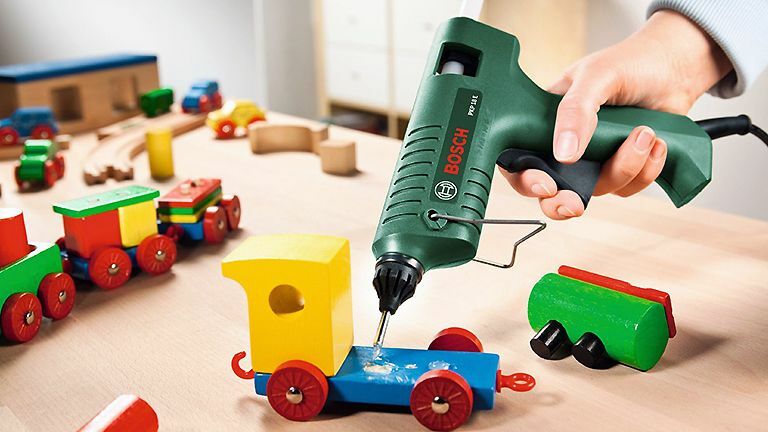 Dremel, which is now part of Bosch, is famous for its eponymous rotary tools, but it makes all kinds of hobby products including this rather charming glue gun. It’s a dual-heat model that takes 7mm glue sticks, and in a nice touch the included sticks feature a rainbow of colours instead of the familiar clear sticks, which you can use as decorative elements in their own right as well as as adhesives. It’s comfortable to use, heats up in five minutes and has a drip control nozzle to reduce unwanted extras from spoiling the join or design. It’s backed with a two year guarantee, which suggests it’ll last a lot longer than some of the other low-cost glue guns on the market.